You play as a “Rudie” (this is already off to a terrible start), a member of a street gang under the umbrella of a pirate radio station, with the sole focus of spray-painting your unintelligible death metal-esque logos all over the city of Tokyo-to. Why? Shut up, that’s why. What happens next? Nothing. That’s the plot. Move along, nothing to see here! 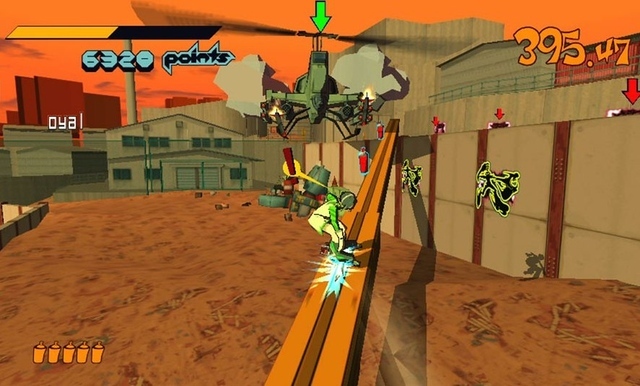 JSR is a 3rd person skating game, and you can expect all the usual tropes – half pipes, grinding, grab tricks that defy logic and gravity – the difference here comes from the main focus of the game in the graffiti. You have to collect spray cans in order to paint over the logo of rival gangs, often found in the most innocuous of places. Once you begin painting, you have to pull off a few quick directional flicks of the right stick, the number and difficulty of which differs depending on the size of the paint-job. The proverbial spanner in the works comes in the form of either rival gangs or police offers that have no qualm about whomping the living crap out of you when you’re trying to paint. And you know what? It holds up well! Huzzahs of the highest order! Granted, not amazingly well, but JSR is certainly still bags of fun. There’s an undeniable thrill in finishing a paint job whilst watching the police barrelling towards you, and once you get a good wide open space to skate in, it’s fast, breezy, and extremely fluid. Certain levels will have rival skaters challenging you to unlock them as a playable character. You do this by matching their line of tricks – usually a sporadic selection of gravity bothering grinds. Again, these are a joy to play, and immensely satisfying. The problems stopping JSR from being truly great are frustrating in that most of them aren’t huge problems. Firstly, the controls. There’s just something horribly clunky about the way your skater moves when you’re not pulling off tricks, and the game often requires you to navigate your way down the tiniest of nooks and crannies. This results in a whole mess of both overshooting your target by a good half mile, and then and arduous climb back up a flight of stairs only to have the same bloody thing happen again! Then there’s those heavy-handed police. A minor annoyance in the first few levels, they become wildly inconsistent in the latter half of the game, coming at you with pistols, rocket launching helicopters and annoying as all hell dogs that clamp onto you and slow you to a crawl. Seems excessive? You bet it is, and nothing is more vexing that being one move of the stick away from completing a painting, only to have a rocket blow you off the roof and down seven storeys. It really ruins the flow of the game, and it smacks of Sega running out of ways to be challenging. Does this strike you as even a trifle necessary against someone spraying GRAFFITI?! 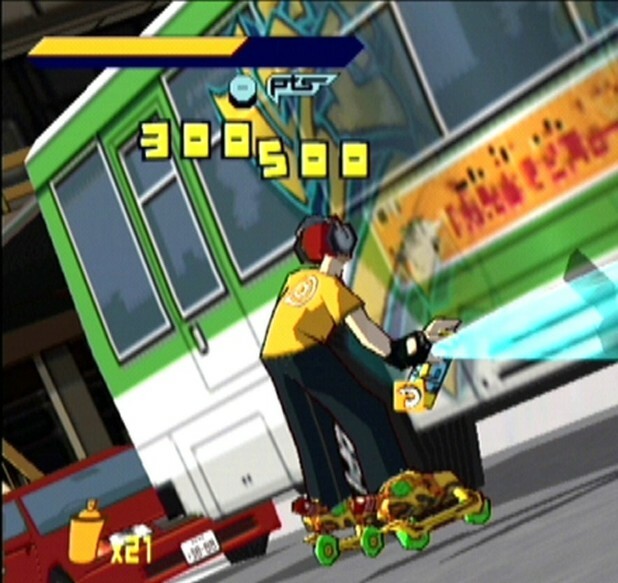 I was truly prepared for Jet Set Radio to be dire. It was such a cult game back in the day I thought it was destined to prove flawed upon revisiting. 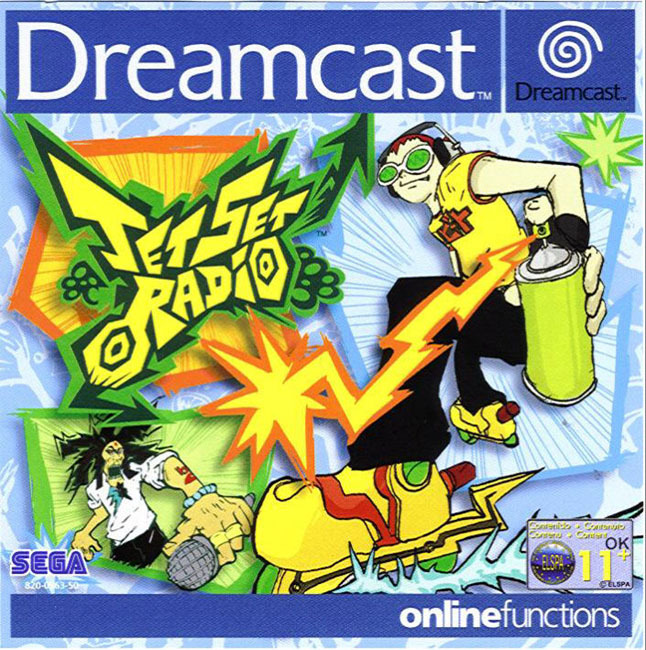 I was pleasantly surprised to find that, in spite of some woefully overpowered enemy units and control niggles, Jet Set Radio is still as fresh, quirky and downright fun as it ever was. Pros : Looks the business, doesn’t take itself too seriously, still fast and fun to play, THAT SOUNDTRACK. Cons: Occasionally controls like a pig, later level enemies are WAY too powerful, THAT SOUNDTRACK! As you know, I loved this at the time. I got the hd remake, and just wanted to scratch my eyes out. The 2nd character unlock with the grind down stairs and jump across river? Fuuuuuuuuuck.